Mike Ullery | Miami Valley Today Ted Mercer, left, takes the oath of office as Miami County Commissioner in commission chambers at the Miami County Safety Building on Thursday. MIAMI COUNTY — New Miami County Commissioner Ted Mercer was sworn in Thursday afternoon. Mercer was appointed to the vacant seat last week by the Miami County Republican Central Committee. It was vacated by former state senator Bill Beagle, who took a position in the office of State Treasurer Robert Sprague. At their regular meeting Thursday afternoon, the commissioners approved the purchase of two tandem-axle semi-truck tractors for the the County Engineer’s office at a total cost of $226,748. The 2020 Western Star trucks replace two older vehicles, 1993 and 1983 models, that have become obsolete. They were traded in for a total of $7,000. The board also authorized the clerk of courts to purchase a new server and licenses for the probate and juvenile courts. The new equipment will replace the current server for the courts, which is beyond its life expectancy, according to Chief Deputy Clerk Shawn Peeples. The commissioners also signed a contract with Auglaize, Clinton, Darke, Mercer, Preble, Shelby and Van Wert counties for the detention of juvenile offenders. The contract set costs for bed space at $95 per bed and $100 for beds in excess of the contract number. It included two beds each for Clinton, Preble and Van Wert counties, two and a half for Mercer County, five for Darke County, six for Shelby County, and six and a half for Auglaize County. 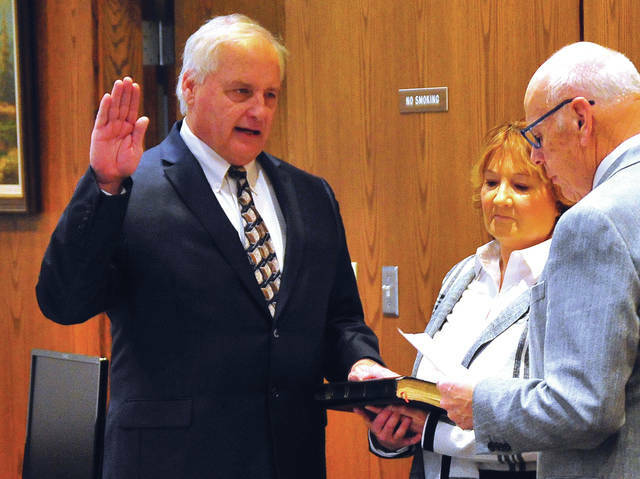 https://www.dailycall.com/wp-content/uploads/sites/30/2019/01/web1_013119mju_mercer1.jpgMike Ullery | Miami Valley Today Ted Mercer, left, takes the oath of office as Miami County Commissioner in commission chambers at the Miami County Safety Building on Thursday.